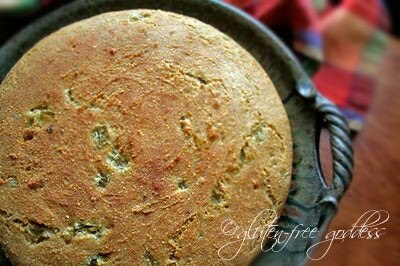 Rustic gluten-free bread- easy and delicious. This is the easiest yeasted bread you'll ever make. Well, from a scratch recipe, I mean. You'll have to whisk together some gluten-free flours and proof a little yeast in warm (not too hot!) water, but you can handle that, right? Once it's stirred together, you smooth it into a cake pan, let it rise in a warm and cozy oven, then bake it. If you want an easier bread making experience than this, Darling, buy any gluten-free mix, dump it into a bread machine and press Start. I'm calling it Pueblo Bread because a certain savvy friend of mine (you know the one- my pal Joey, who makes the best damn guacamole recipe this side of the Mississippi) who knows from Nuevo Native American cuisine, called it (and my quote could be slightly inaccurate, Gentle Reader, due to consuming literal fistfuls of organic hand-popped popcorn to quell the mind-numbing boredom of enduring two and half hours of There Will Be Blood), Tasty and authentic, and not unlike the local Pueblo style breads. As for the movie choice? My bad. Maybe the sheer Shakespearean brilliance of Deadwood has spoiled me forever when it comes to period westerns (it's possible). Next time I'm picking something with Frances McDormand. The men will just have to deal. 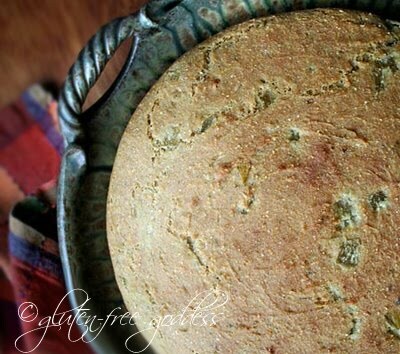 Rustic gluten-free pueblo style bread. This hearty tender bread is lovely with steaming bowls of chili, soup, slow cooked stew, and any Mexican-style or rustic recipes your family loves. Choose mild or spicy roasted green chiles for this grainy wheat-free bread; gentle or knock 'em dead hot, it will be delicious. Note: I've tweaked this recipe a bit since it was first posted in 2008. Turn your oven on briefly to warm it, then turn it off. Line a 8 or 9-inch cake pan with parchment. Sprinkle a little gluten-free cornmeal on the bottom, and set aside. Proof the yeast by adding it to the warm water with a pinch of sugar or dab of honey. Set aside to get poofy. Meanwhile, whisk together the GF cornmeal, flours, and dry ingredients. Add in the proofed yeast and water mixture, eggs and oil. Stir to combine. The dough should be like muffin batter. Add a tablespoon of warm water, or two, if needed. Add in the green chiles by hand, and stir until the dough is smooth. Spoon the dough into a cornmeal dusted cake pan and smooth with wet hands or a rubber spatula to form a loaf. Place the pan into a warm oven (not too hot, as you don't want to bake it, just coax it to rise). When the dough has doubled in height, turn on the oven and set it to 375ºF. Bake for 25 to 35 minutes until the loaf is firm to the touch and slightly golden. It should sound a bit hollow if you tap it. If in doubt- check with a wooden toothpick- it should be dry; a few moist crumbs are okay. Serve warm or at room temperature- but warm is best. Grill leftover slices in a little olive oil for a breakfast treat. Yields 8 to 10 slices. We enjoyed wedges of this bread dipped in Italian extra virgin olive oil.